Nicholas Mukomberanwa’s jaw-dropping ‘Nzou’ (Elephant) – he was unafraid to work on a monumental scale! Nicholas Mukomberanwa is the most influential and internationally respected artist in the Zimbabwean sculpture movement. Nicholas was born in Buhera, Eastern Zimbabwe, in 1940. He attended the Serima Mission school where an early artistic and creative talent was nurtured. As a young man, he moved to Harare (then Salisbury) and started a career as a policeman. He began sculpting again in 1962, when he met the new Director of the National Gallery, Frank McEwen, and joined his Workshop School. Frank encouraged free self-expression of the artist’s subconscious mind, rather than providing formalised training and pigeonholing the work produced. Nicholas responded enthusiastically to this environment, and created some simply astonishing works which were exhibited in galleries around the world. He finally left the police force in 1976 to become a full-time sculptor, and continued with great critical acclaim until his death in 2002. His work formed part of several seminal exhibitions during the 1960s-1970s period, including at the Musée Rodin (Paris) where his piece was selected for the poster image and the Institute of Contemporary Arts (London). He also had six solo exhibitions. 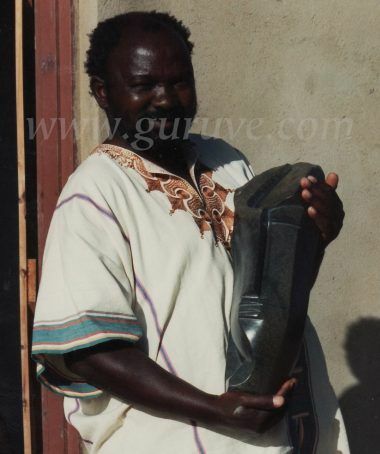 Guruve regard Nicholas as the greatest sculptor Zimbabwe has ever produced. 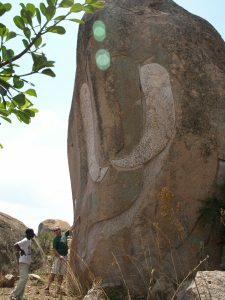 He is the only Zimbabwean artist who has created work on a grand scale that sits in the landscape – his sculpture of an elephant from an enormous granite kopje is a lasting legacy to Zimbabwe’s cultural heritage. He had the same vision and ability as Henry Moore and he is much missed. We also have a few pieces of Nicholas’ work that are not yet on the web gallery. If you are interested, please contact us and we can send you photos.